Delight your guests, friends, and family members with dynamic motorized figurines to capture the excitement of holiday magic. Choose from classic and timeless designs to funny moving characters with their own festive soundtracks. Create your own miniature mantelpiece set with Mr. and Mr. Santa Claus, carollers, angels, or reindeer. Add foliage or ribbon to draw attention to your dynamic display and enhance the whimsical winter wonderland you’ve created. Turn on some Christmas carols and enjoy the show! Relive your favourite holiday memories with these festive holiday likenesses. Share old Christmas tales with your friends and family and celebrate the joy of your most cherished holiday traditions. Choose from a wide variety of seasonal Santa’s standing proud or caught in their most iconic acts: driving a sleigh, carrying a sack of toys, or hopping down the chimney. Mrs. Claus can be seen carolling, while the angel of Christmas glows and stretches her wings. A playful mix of fibre optics and life - like animation help bring these beloved characters into the magical movement of your holiday household. Fibre optics add shimmer and glow to your moving figurines, allowing the angle to erupt in a whimsical ripple of light or Santa to shine from the rooftops while he clicks his boots. Fibre optics are made from thin strands that conduct light to their ends and emit a delicate array of pinpointed shine. Each fibre optic strand can shine steadily or change colour slowly for a fantastical rainbow array of light. Adding fibre optics to your motorized figurine helps create a multidimensional aesthetic while staying true to the traditional Christmas cast of characters. Optic light details also illuminate your figurine in low light or complete darkness for a holiday decorating scheme that shines all through the night. Moveable figurines also come with optional built - in musical accompaniment. Watch your Christmas character dance, move, or work to the rhythm of your favourite classic carol or a trendy holiday mash - up. 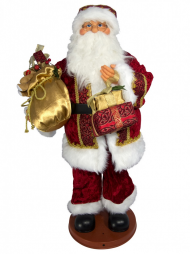 Choose between realistic replicas and cartoonish renditions of your Christmas figures to add a traditional or humorous tone to your seasonal celebrations. For an up - to - date twist on the traditional moveable figurine, opt for a funny reindeer, Santa mishap, or a playful Christmas reference to an internet sensation. Christmas is about spreading joy and laughter, and what better way to enjoy the company of others than to share the gift of humour. From seasonal cover songs to funny pop - culture references, the humurous holiday figurine is sure to put a smile on your face. Whether you’re going traditional or funny, our selection of battery - operated holiday figurines has a little something for any taste or occasion. Grace your mantel, display shelves, or side tables with a loveable animated figure that moves to its own music or follows along with your own soundtrack. Bring a fun motorized character to the office to make your colleagues laugh and spread the holiday cheer. Enhance the festive spirit of your flat or apartment space with a funny gag figurine to delight friends and flatmates. Decorate your home bedroom, den, living room, or dining area for Christmas Eve dinner or holiday brunch with charming motorized figures to entertain your guests. Children love to watch these figures as they cycle through their many movements, transform into lifelike miniatures, and perform their tiny seasonal duties. Ignite your sense of imagination as your favourite Christmas stories are brought to life in intricate moving detail. Draw upon these figured to create your own tales of Mr. and Mrs. Claus, flying reindeer, and Christmas miracles to pass on to your children and create memories to remember for years to come. For the hard - to - please Christmas recipient, try delighting their senses with a timely motorized figurine, complete with trendy references and funny holiday mash - ups. Give the gift of joy this holiday season by adding an animated Christmas character to your list of enjoyable decorating traditions.